Creative Family Counseling has launched a new website in conjunction with the opening of a new practice in Louisville, Kentucky. (PRLEAP.COM) Creative Family Counseling, owned by Clinical Director Lacey Ryan, LMFT, is excited to announce the launch of a new website design and the opening of a new practice location in Louisville, Kentucky. The new website design features overviews of the counseling services offered at Creative Family Counseling, information on the therapeutic specialties available, history of the team of therapists, therapy resources, testimonials, and more. Along with the new website design, Creative Family Counseling has opened the doors of a new practice location at 8134 New LaGrange Road, Suite 227, in Louisville, Kentucky and the practice is currently accepting new patients. Prior to launching the expansion of Creative Family Counseling, Lacey Ryan worked independently in private practice. She was and still is a member of the Louisville Presbyterian Theological Seminary Clinical Staff. In the past, she worked largely within the non-profit foster care and adoption sector, as well as in community mental health. Looking back at the time she spent counseling prior to opening Creative Family Counseling, one thing remained consistent — Lacey's utilization of creativity within her sessions. Now Lacey is able to incorporate her creative approach to counseling in the day-to-day practices of Creative Family Counseling. Alongside her team of LMFTs, MFT Associates, and her therapy dog — Lola the Great Dane — Lacey offers a wide variety of counseling services to children, teenagers, adults, couples, and families. Children express their feelings and communicate through play. By playing, they learn how to problem solve, control emotions, resolve conflict, and overcome challenges. At Creative Family Counseling, therapists are trained to use creative therapeutic interventions like using toys, games, art, dance, and music to help children communicate their emotions. Teenagers often deal with struggles as they transition from childhood to adulthood. This is difficult to navigate alone, but when they come to Creative Family Counseling they don't have to be alone. The therapists at CFC are honored to work with teenagers during this transformative time and help them discover the strengths they have and can use, to overcome challenges. Life can be difficult at times and sometimes it's necessary to seek help. The Creative Family Counseling team is trained to use a variety of goal-oriented and solution-focused treatment approaches in order to create a collaborative therapy plan. Some common issues that individuals often seek therapeutic services for include depression, grief, anger, anxiety, suicidal thoughts, and more. Creative Family Counseling is a safe space for all individuals looking to improve their lives and wellbeing through therapy. Couples, like individuals, face a wide array of challenges throughout their lives. From financial strain and infidelity to addiction and child-rearing differences, the struggles can seem endless; however, with the help of the team of licensed therapists at Creative Family Counseling, couples can navigate through their struggles and come out stronger. A familial bond is a strong bond, but that does not mean families don't face hardships which test that strength. Oftentimes, families seek help through counseling when they've experienced a loss, divorce, or are recovering from a traumatic event. At Creative Family Counseling, therapists are trained to work with various family systems, find ways to break out of unhealthy lifestyle patterns and discover healthier ways to interact within a household. The services offered at Creative Family Counseling are not limited to different varieties of therapy services. Lacey also offers individual and group MFT supervision for graduate-level Marriage and Family Therapy Associates who are seeking licensure. Lacey, and her team, also offer an array of therapeutic specialties including Eye Movement Desensitization and Reprocessing (EMDR), Emotionally Focused Therapy (EFT), Play Therapy, Spiritually Integrative Counseling, and Animal Assisted Therapy. These specialized treatment options are available for those who feel they have not had success with past therapy experiences or are looking for a more specialized therapeutic experience. 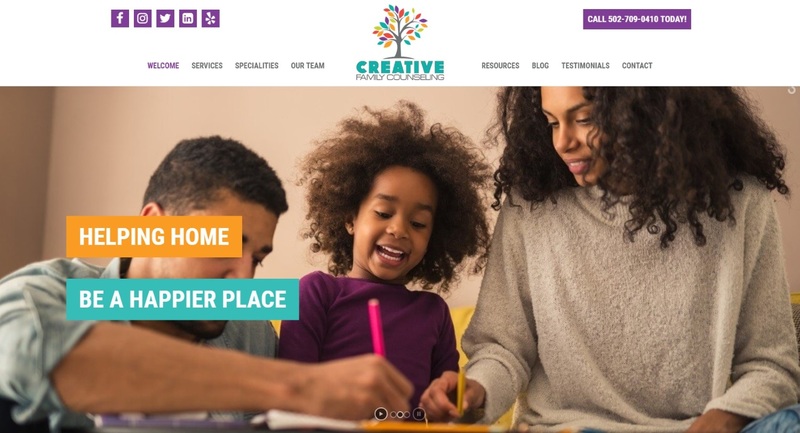 While the new website for Creative Family Counseling has been live since the beginning of 2019, the new location officially opened its doors after a ribbon cutting ceremony on February 1st. The new practice is located at 8134 New LaGrange Road, Suite 227, in Louisville, Kentucky and all therapists are currently accepting new patients. Due to patient privacy being a priority, none of the therapists at Creative Family Counseling contract with insurance companies, so each therapist is considered an out-of-network partner. By not accepting insurance, the team at Creative Family Counseling is able to work with patients on the frequency of visits and types of counseling without being limited by insurance policy guidelines. If you have any questions, you can visit the Frequently Asked Questions page on the website or contact the practice by calling 502-709-0410. The practice is open for general calls Monday through Friday from 9:00 a.m. to 5:00 p.m., but some therapists even have evening availability. If you would like to contact Creative Family Counseling after hours, there is a contact form available on the website. Creative Family Counseling is a new therapy practice, owned and operated by Clinical Director Lacey Ryan, LMFT, that is located in Louisville, Kentucky. Lacey describes her practice as "a group of therapists who share a like-minded approach to working with clients" and the team practices a collaborative approach in each therapy session with their patients. Every counseling experience is tailored to the specific patients' needs and no two sessions are alike. For those looking for individual therapy, family therapy, therapy for teenagers and children, or a more specialized approach, Creative Family Counseling is trained to equip all patients with the tools and knowledge needed to develop creative solutions to their problems that will also help encourage growth and personal healing. For more information on the practice, the team, and the services offered, visit the Creative Family Counseling website today. Lacey Ryan graduated from Eastern Kentucky University with a Bachelor of Science in Psychology and a minor in American Sign Language in 2006. After graduation, she decided to further her education and obtained a Master of Arts in Marriage and Family Therapy from Louisville Presbyterian Theological Seminary in 2008. Since getting her Masters, Lacey has become a member of the LPTS MFT Clinical Staff and supervises interns at her Alma Mater. A wife, mother, and pet owner, Lacey enjoys working with children, teenagers, and adult women who are struggling with anxiety, panic, depression, behavioral issues, grief, and more. She utilizes her creative background and clinical experiences in her therapy sessions and is passionate about helping her patients achieve personal growth while developing healthy methods of interaction.